Still in the market for a Google TV? Deals site Woot! is hosting a pretty good deal on the Sony NSZ-GS7, a year-old model of the company’s Google TV lineup. The boxes are new and not refurbished, still selling for around $150+ on Amazon and other e-retailers. With the box, you can access Google Play and many Android apps right from your HDTV, as well as control Netflix, Hulu and other content providers like that. The Sony also comes with a nice remote, featuring a full keyboard for browsing the web right from your couch. 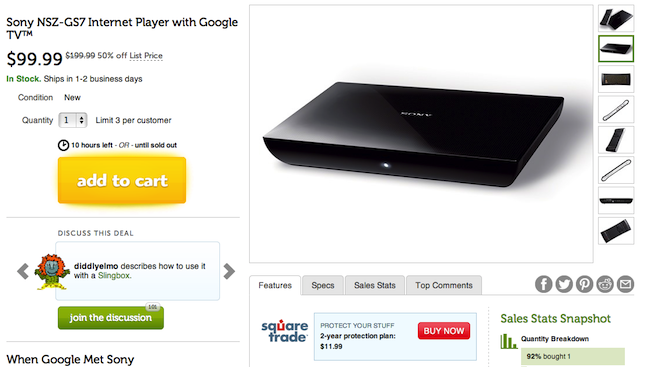 All around, it’s a pretty good deal for last year’s top tier Google TV box. Anyone here own this device that can vouch for its awesomeness?